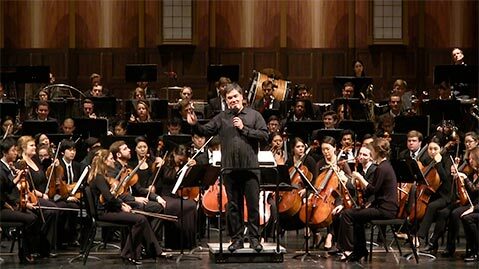 <strong>ON THE MARCH:</strong> Maestro Alan Gilbert led the Academy Festival Orchestra in two symphonic pieces featuring <em>“Marsch”</em> movements, one by Beethoven and the other by Alban Berg. How is it possible that the most exciting musician in America right now performs without making a sound? That’s easy — Alan Gilbert is a conductor. A former violinist and the outgoing musical director of the New York Philharmonic, Gilbert fulfilled the third of his four years’ commitment to the Music Academy of the West on Saturday by leading the Academy Festival Orchestra in an outstanding program that featured works by Joseph Haydn, Alban Berg, and Ludwig van Beethoven. Through a combination of period practice in the seating of the strings and a tempo that was steady and forceful without being overly fast, Gilbert brought these excellent young musicians together in a thoroughly joyous achievement in music making. The juxtaposition of Beethoven’s second movement, marked “Marcia funebre: Adagio assai” with the recent memory of Berg’s third movement “Marsch” called forth a seemingly endless set of thoughts and ideas about not only symphonic music but also the role of conflict in history and the future of Europe. It’s hard to imagine a more pertinent form of musical expression for today, and the spirit with which it was performed made this evening unforgettable.